What are OraVet Dental Hygiene Chews? OraVet Dental Hygiene Chews are dissolvable, dual-action chews made for daily use to help clean and protect your dog's teeth and gums. The dense, chewy texture mechanically scrubs away existing plaque and oral calculus as your dog chews it. An exclusive key ingredient, delmopinol, is released during chewing, which creates a barrier to prevent the attachment of bacteria to teeth, tongue, and gums. This, in turn, inhibits the production of the biofilm that forms plaque. It also reduces the sulfur compounds that result in bad breath. Delmopinol has been used in human dentistry for years, so you can be confident about both safety and effectiveness. 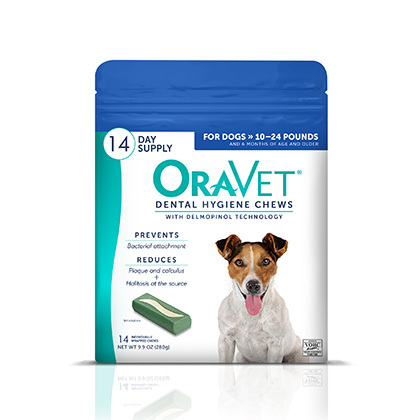 With daily use, OraVet Dental Hygiene Chews have shown a 53% reduction in halitosis (bad breath), a 42% reduction in plaque, and a 54% reduction in oral calculus when compared to dry diet alone. 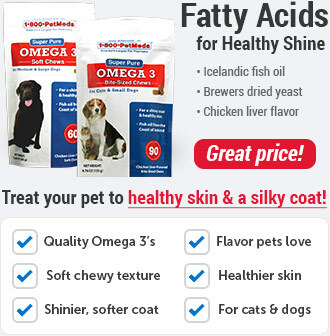 OraVet Dental Hygiene Chews are highly digestible and have a tasty vanilla flavor dogs love. 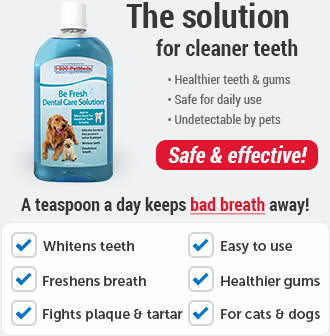 How do OraVet Dental Hygiene Chews work? OraVet Dental Hygiene Chews soften and remove dental plaque and calculus, while also creating a barrier against attachment of bacteria to teeth, tongue, and gums. The natural chewing mechanism softens and removes existing plaque and calculus, while releasing a protective agent to prevent future plaque buildup. The key ingredient is delmopinol, a compound found in therapeutic mouth rinses used in human dentistry for the reduction of plaque and gingivitis. OraVet Dental Hygiene Chews should be used as part of an overall dental health regimen that includes regular veterinary visits and at-home care. 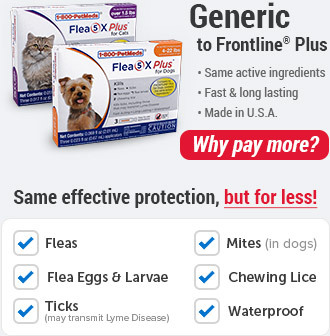 Not recommended for puppies under 6 months of age, pregnant or nursing dogs. Do not underdose; give the entire appropriately sized chew to your dog, do not cut or break as this may present a risk of choking. 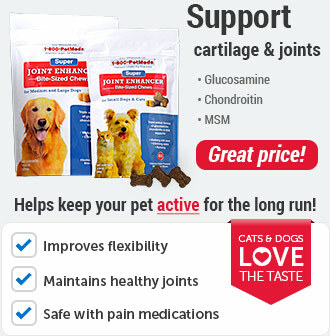 Do not give more than one chew per day to each dog in the household. Weigh your dog to ensure you give the appropriately sized chew. Do not give to cats. Keep out of the reach of children. 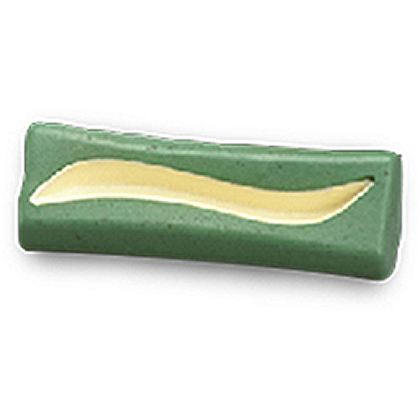 Monitor your dog until the OraVet Dental Hygiene Chew is fully consumed. Give one appropriately sized OraVet Dental Hygiene Chew to your dog each day to clean teeth and freshen breath. Weigh your dog to ensure you give the appropriately sized chew. See the chart below to determine which size your dog needs. Do not give more than one chew to your dog per day. Do not underdose, as this may present a risk of choking. 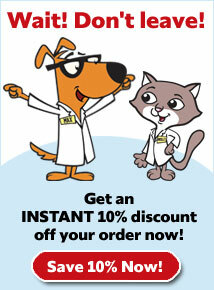 Monitor your dog until the OraVet Dental Hygiene Chew is fully consumed. 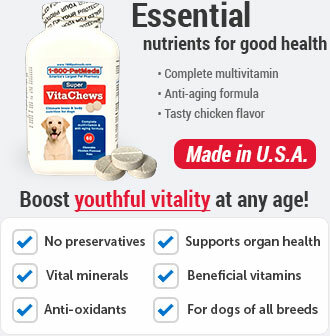 Be sure to give the entire chew to your dog, do not cut or break. Keep fresh water available at all times. Store at room temperature (20-25° C or 68-77° F). Keep in wrapper until ready to use. Do not use if wrapper is open.